It's been over 10 years since the publication of Sam Harris's book The End of Faith, and yet people still smear him for allegedly calling for or contemplating a nuclear first strike against the Muslim world, generally. "I mean, Sam Harris, at the end of his first book, asks us to consider a nuclear first strike on the Arab world." "There is little possibility of our having a cold war with an Islamist regime armed with long-range nuclear weapons. A cold war requires that the parties be mutually deterred by the threat of death. Notions of martyrdom and jihad run roughshod over the logic that allowed the United States and the Soviet Union to pass half a century perched, more or less stably, on the brink of Armageddon. What will we do if an Islamist regime, which grows dewy-eyed at the mere mention of paradise, ever acquires long-range nuclear weapons? If history is any guide, we will not be sure about where the offending warheads are or what their state of readiness is, and so we will be unable to rely on targeted, conventional weapons to destroy them. In such a situation, the only thing likely to ensure our survival may be a nuclear first strike of our own . . .
How would such an unconscionable act of self-defense be perceived by the rest of the Muslim world? It would likely be seen as the first incursion of a global genocidal crusade. The horrible irony here is that seeing could make it so: this very perception could plunge us into a state of hot war with any Muslim state that had the capacity to pose a nuclear threat of its own. All of this is perfectly insane, of course: I have just described a plausible scenario in which much of the world's population could be annihilated on account of religious ideas that belong on the same shelf with Batman, the philosopher's stone, and unicorns. That it would be a horrible absurdity for so many of us to die for the sake of myth does not mean, however, that it could not happen." Source: The End of Faith, by Sam Harris, p. 128–129. To misconstrue this passage as Sam Harris simply "[asking] us to consider a nuclear first strike on the Arab world" is blatantly deceptive, because such a summary completely ignores the key aspect of the thought experiment: the de-facto suicide bombers with nukes coming to power. If all we had to go off of was this summary that Chris Hedges presented us with, for all we'd know, Sam Harris might have just said "Well, look, we have all these Muslims in mosques praying 5 times a day on their rugs in the Middle East, and maybe we should just nuke them." This summary simply doesn't tell the whole story about what it is that Sam Harris was saying in that passage, and it also overlooks the fundamental point that he was making in that section. "All of this is perfectly insane, of course: I have just described a plausible scenario in which much of the world's population could be annihilated on account of religious ideas that belong on the same shelf with Batman, the philosopher's stone, and unicorns." This is the key point here that people overlook. This is the ultimate message that Sam Harris is conveying in this passage. The mention of nuclear weapons isn't even necessary for making the broader point. He could have instead said something like "What if a suicidal, jihadist regime built a death ray on the moon and they were planning to use it to annihilate life on Earth? ", and the exact same point would have been made: That these ludicrous religious beliefs could conceivably lead to a planet-wide destruction of civilization and life. So when people respond to this passage with things like "Would a first-strike truly be the best response? Isn't even considering this course of action insane?". they're clearly missing the forest for the trees. Cenk, allow me to spoonfeed you something so obvious that it makes me embarrassed for you to even need to say it: Sam Harris also doesn't want tens of millions of people to die in a nuclear war. That is the point of this passage. He's saying: Just imagine how terrible it would be if these religious beliefs led to such an outcome? Cenk portrays it as if Sam Harris wants this happen—as if it's some kind of tantalizing fantasy to him—when precisely the opposite is the case: He's instead inviting the reader to envision a horrifying nightmare. I should also add that it's extremely amusing to see Cenk so energetically, so emotionally, and so arrogantly make what is ultimately a completely misguided argument. It's like watching somebody go full speed, pedal to the metal, with tires screeching, in the wrong direction in a street race—all while being utterly and smugly convinced that they're smoking the competition. So, in sum, this passage from The End of Faith is just one of many examples given in the book of the tremendous harm that can or does result from religious beliefs. 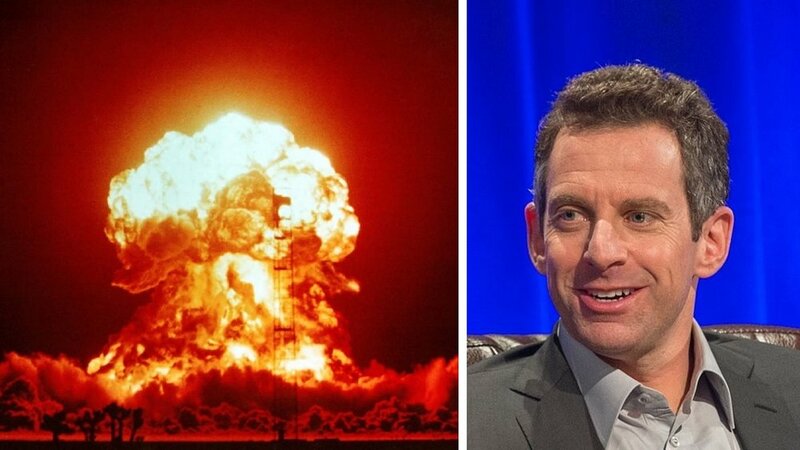 But instead of focusing on the broader thesis of his book, people—usually people who haven't actually read the book—completely miss the point of this particular section and inaccurately portray it as Sam Harris simply calling for or considering a nuclear first strike against the Muslim world. Launch a nuclear first-strike against my Patreon page. And by nuclear, I mean...give me your money.